The second of three core rulebooks for the 4th Edition Dungeons & Dragons Roleplaying Game. The Dungeon Master’s Guide gives the Dungeon Master helpful tools to build exciting encounters, adventures, and campaigns for the 4th Edition Dungeons & Dragons Roleplaying Game, as well as advice for running great game sessions, ready-to-use traps and non-player characters, and more. In addition, it presents a fully detailed town that can serve as a starting point for any D&D game. Core Rulebook: The Dungeon Master’s Guide is the second of three core rulebooks required to play the Dungeons & Dragons Roleplaying Game. 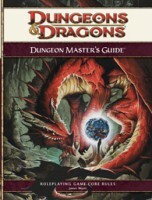 D&D Insider: The Dungeon Master’s Guide will receive enhanced online support at www.dndinsider.com. At this point, I don’t play a lot of D&D. I have got to say though, after getting over the initial shock, I have seen a large number of haters embrace 4E. For people that are not into RPGs or don’t know if they are, this is a great book to help someone run a game and this is a great system for bringing in new people. The book introduces a concept known as Skill Challenges, which although they can be very frustrating, take D&D in a new direction from all the previous editions. They are clunky as they are in the book, but it is possible to take the concept and make some amazing encounters out of it. Building encounters that are well balanced is a fantastic benefit of using the DMG. A major problem with the DMG is that the Difficulty numbers and some of the other numbers throughout the book have all been errata’d. Be careful of making challenges too difficult by using the numbers in this book. The other problem that I have with this book is that it doesn’t offer too much in the way of advice for creating stories and the things that make RPGs really come alive. There isn’t much in the way of setting advice or non player character creation. So although this book does help people make great encounters and it is easy to do so, making something beyond the tactical game portion of D&D using this book does take creativity and work. As a first time Dungeon Master running my own 4e campaign, this book has proven invaluable. The book doesn’t really go into the detailed nuts and bolts of the new 4e rules. That job is reserved for the Player’s Handbook, which makes sense because it’s best if all your players have a firm handle on the rules. The DM’s Guide instead gives you the tools to craft an adventure your players will enjoy. The book goes into details about finding balance when doling out treasure and experience, how to throw the right level of monster threat at your players without slaughtering them or making it feel like they’re beating on 3rd graders. It presents something called skill challenges which is the opposite of combat. Skill challenges give a frame work for using a players skills and talents like athletics, diplomacy, acrobatics, etc in a tactile way to achieve success in a quest without thumping heads in. With the right encouragement and the right mind set this can also give a frame work for players to really role play around. The book also gives you ideas on different gaming approaches, from epic campaigns to random weekend dungeons. The book tries to set you in the right frame of mind for guiding your players on an adventure that they’ll both help create and never forget! Basically, it sets out to help you become a better story teller, and gives you the tools within the DnD world to accomplish this goal successfully. The book, from a functional and aesthetic level, is well made and organized. Chapters flow naturally and are easy to read continuously or just spot check as a reference. My own copy of the DMG has got several pages tabbed for easy reference during games because while the book is heavy on theory and concept, it does have some valuable charts and breakdowns that are good to have handy during gaming. Plus there is some very nice art work within that can also help stir your imagination! Ultimately, this book is going to best serve the person who’s looking to gather his friends and set them on the path of adventure. If you’re only looking to play DnD from a player’s stand point this book is only a “nice to have” if you felt like peaking behind the Wizard’s curtain. I own the DMG from AD&D2E as well, and I still poke around in that volume for ideas but the current edition really does help first timers get the ball rolling nicely. So if you sound like the former, then grab this tome, give it a read through and bring out your inner Tolkien, Martin, Goodkind or Jordan!! This is the best DMG that Dungeons and Dragons has produced. I have been playing D&D since the late 70’s and I have muddled through many different versions of this book. Some very user friendly, others.. not so much. I was not a big fan of 4th edition. So the system specific rules that have in this book, I don’t pay much attention to. However, there are many gems of wisdom for a new Dungeon Master. If I was a starting D&D player getting ready to run a game, this would be priceless. This is a hard product to review. As far as re playability, it is very dependent on the person using the book. The Dungeon Master is responsible for using his imagination to create an immersive and enjoyable role playing experience. Someone with a good enough imagination would not even need this book. It does little in the way of expanding the rule set of D&D and for the most part contains a lot of fluff and suggestions. As was states by a previous reviewer, the current edition is much less useful than previous editions. As a whole D&D is the introduction most people receive to pen and paper role playing games. But with an abundance of better but less well know RPG’s on the market, many soon gravitate away from the mass market mentality of D&D. With a good group of friends and someone who is a decent storyteller any RPG can be fun. I feel you can simply get more from your money elsewhere. Even when I am DMing a game, I find I turn to the Player’s Handbook for rules far more often than I use the DM guide. It’s a great tool for beginners to learn how to be a DM, but for anyone that has been into roleplaying for years it doesn’t bring a whole lot new to the table. That said, it does help teach how to run the tactical mini combat, which is the major new mechanic of 4ed. But again, if you are someone that has played a lot of mini combat games, it’s not as necessary. I’ll start this by saying I am not a fan of D&D 4E. I will, however, say that the Dungeon Master’s Guide has some gems in it (some that I use in Pathfinder). Skill challenges are great. They provide a good template for cinematic action. Best used in combat, where multiple things are going on. The idea that different charactters contribute different things is great, and this can allow non-focal character to have a meaningful role in a given encounter. If for no other reason, borrow this book from a friend and read this section. Add a Review for "Dungeons & Dragons (4ed): Dungeon Master’s Guide"